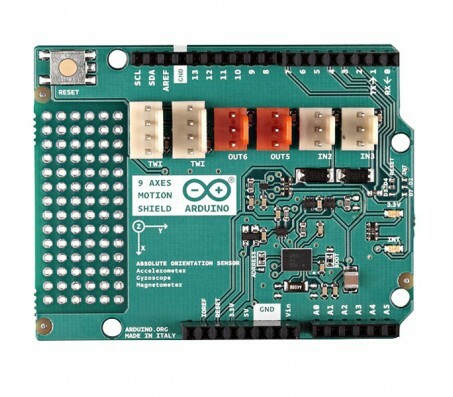 Description: This Arduino 9-axis Motion shield incorporates an accelerometer, a gyroscope and a magnetometer in one neat package. Using a Bosch BNO055 orientation sensor it provides raw sensor information plus processed values which combine sensor readings. 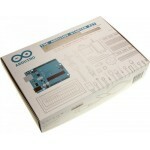 Values such as quaternions, Euler angles, rotation vectors and others are calculated on the chip saving your Arduino (and you!) from working so hard. As well as calculating values, the on-board Cortex M0 processor can be programmed to generate interrupts on a wide range of detected motions including rotation and acceleration. 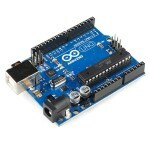 Interfacing to the board is very simple either via I2C or serial UART. The Motion Shield is also Tinkerkit compatible allowing you to plug in a wide range of indicators, user controls and sensors.